This 1898 ad notes that "The Magazine works with the speed and accuracy of a repeating rifle." Since my Bullard camera came with most of the original plates and sheaths, I thought to give the changing magazine a try. Considering the test results, it is not hard to imagine why this novel design met with limited success and was always missing the rear leather strap. Although I could get the magazine to work, it jammed quite frequently, leading me to wonder about the quality of those 19th century repeating rifles. Note: The rear strap is still attached to the magazine after the test. 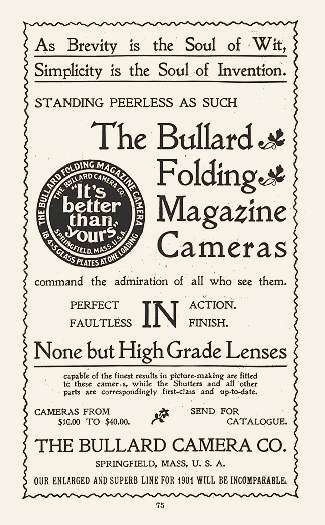 "is entirely too fine for the money"
"command the admiration of all who see them"
For 1901 Will Be Incomparable." 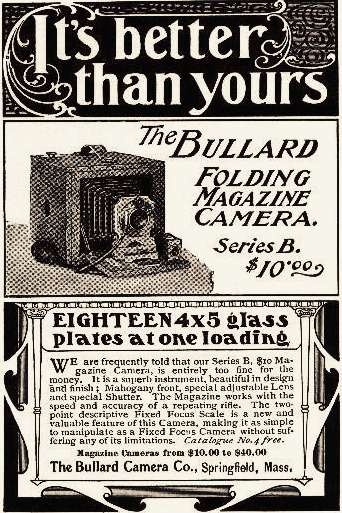 Shortly afterward, largely due to the decline in the popularity of dry plate cameras, The Bullard Camera Company was absorbed into the Seneca Camera Company in late 1901 or early 1902.